Home Office Security Keypad Lock Electronic Digital Steel Safe protect and secure your precious valuables. It can be used within home and office to hold jewelry, noble metals, cash, documents, or other hard-to-replace items. The safe offers two options to open, code or key. Solid and robust steel construction with sturdy locks keeps your belongings secure at all times so you can rest assured to rely on it. And it can be bolted to walls or cabinets and perfectly hidden. Don't hesitate to get one now! Attention: Please notice that the keys are in the box so that you could not open them when you forget the password. 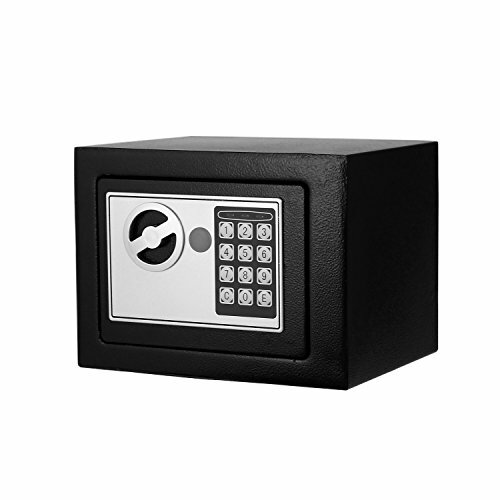 STRONG & SECURE: The fireproof safe box is made of reinforced solid steel wall construction. Dual security steel door locking bolts & a corrosion & stain-resistant powder coat finish keeps the drop box safe. [ The home safe box has pre-drilled holes for wall or floor mounting ]. If you have any questions about this product by Flyerstoy, contact us by completing and submitting the form below. If you are looking for a specif part number, please include it with your message.